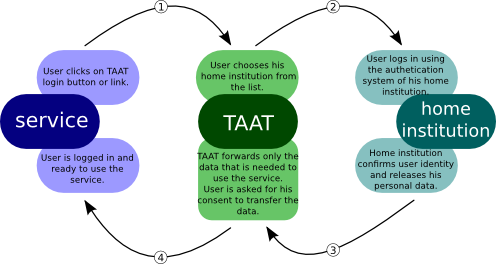 TAAT stands for Estonian Academic Authentication and Authorization Infrastructure (Eesti haridus- ja teadusasutusevahelise autentimise ja autoriseerimise taristu). It enables electronic identities (user accounts) issued by education or research institutions to be used to access several web based services. The principle of TAAT is that users don’t need a separate user account for each service but they can use their excising account and authentication system of their home institution. Only the information that is necessary for using the service is being sent during the authentification process. Users have to their consent to have information about them passed on. TAAT also permits using a single log-in between different services (SSO). TAAT is a free service provided by EENet to Estonian education and research institutions. Every participant is bound by a contract and is obligated to ensure that all the requirements on personal data management are met. That provides maximum security and reliability in TAAT network.